What Do Job Seekers Want in a New Role? In a competitive job market, employers must make compelling job offers to hire and retain employees successfully. 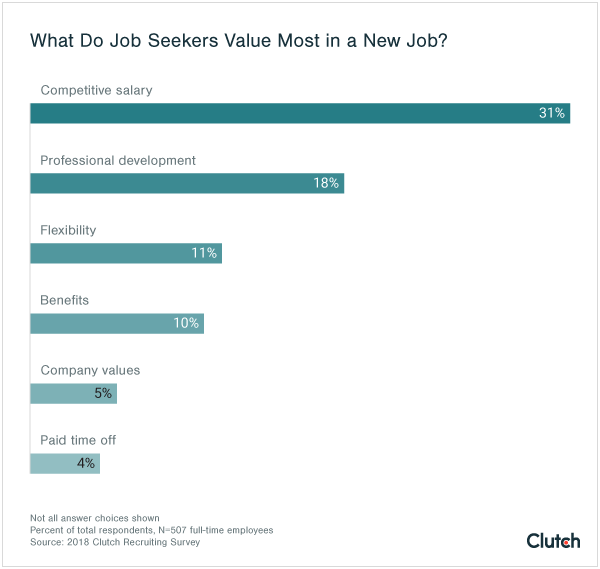 Our data reveals that employees value salary, flexibility, and professional development when evaluating a job offer. Employers should also pay attention to emerging benefits such as student loan repayment. Companies and recruiters know how difficult it is to hire new employees. With unemployment low in 2018, job seekers can afford to be selective about where they work. We surveyed 507 people who started a new job within the past six months to learn more about what factors influenced their decision to look for a new job and accept a company’s offer. We found that above all, job seekers are looking for opportunities that advance their financial goals. The most compelling job offers provide a competitive salary, work/life balance, opportunities for advancement, and benefits that support long-term financial stability. Companies can use this article to inform the salary, benefits, and perks they offer candidates. Most job seekers (75%) are voluntarily looking for a new job and can afford to be selective. Only 10% are on the market due to losing their previous job, and only 8% are seeking their first job. Approximately one-third of job seekers (32%) begin a job search to find better pay and/or benefits. Job seekers rank salary as the most important factor when searching for a new job. Nearly one-third (31%) focus on salary above other aspects of a job offer. Flexibility is slightly more appealing than traditional benefits such as health insurance, especially among women. Overall, 11% of job seekers say flexibility is the most important element of a job offer – but 13% of women rank it first, compared to only 8% of men. Nearly 1 in 5 job seekers (18%) want more professional development opportunities in a new role. Only 5% of job seekers say a company’s mission is the determining factor in their job search, and only 4% value vacation or paid time off (PTO) policy above other factors. Only 10% of job seekers say benefits are the most important factor in a job search. People are increasingly aware that some companies offer student loan repayment benefits. Nearly one-third of job seekers (31%) encounter this benefit during their search. Most job seekers are on the market by choice and can afford to be selective about where they work. Voluntary job seekers (75%) are on the market to find a new role or a job in a new location. Involuntary job seekers (10%) are not on the market by choice. Although some may have lost their previous job due to poor performance, others are laid off due to factors beyond their control. First-time job seekers (8%) have never had a job before, typically after graduating from college. Voluntary job seekers’ top motivations include better pay or benefits (32%), entry into a new industry (10%), a new location (8%), or leadership opportunities at work (7%). Relatively few job seekers are on the market after being fired or laid off (10%). A small percentage (8%) are seeking their first job. Job seekers who are on the market voluntarily often can often wait for an offer that matches their goals. With unemployment low in 2018, the job market tilts in candidates’ favor. To hire successfully, companies must understand and respond to job seekers’ goals. Overall, job seekers value compensation above any other factor. Nearly one-third of job seekers (31%) say that salary is their top concern when selecting a new job. Professional development (18%), flexibility (11%), and benefits (10%) follow. Relatively few job seekers believe that a company’s mission or values (5%) or vacation/PTO policy (4%) are the most important considerations when selecting a new job. In the following sections, we’ll unpack the most important trends and best practices behind job seekers' top goals when looking for a new role. Companies that want to attract new employees must offer a competitive salary. For 31% of job seekers, salary is the most important element of a job offer. For companies, establishing an employee’s salary requires a balance between offering fair pay and keeping overhead costs low. Employee compensation makes up a significant chunk of companies’ overall spending, so it can be tempting to save money by offering slightly lower pay – but this can breed dissatisfaction among employees. Salary is more than just an overhead cost. It impacts employee retention, which in turn determines a company’s turnover. According to Employee Benefit News, the costs associated with replacing an employee who leaves can total to about one-third of that employee’s salary. Replacing an employee earning $45,000 would cost approximately $15,000 in lost productivity, recruitment, and training. Katie Donovan is an equal pay expert and consultant who runs Equal Pay Negotiations LLC, a company dedicated to achieving equity in the workplace. She warns that unequal pay can lead to low morale and high turnover. To avoid underpaying workers, companies should offer at least the median salary for their industry. Companies in highly competitive industries should be prepared to negotiate with candidates who may request higher pay. Overall, private industry employers today spend an average of $34.19 on employee compensation per hour worked – a small increase from 5 years ago, when private industry employers spent an average of $29.63 per hour. Companies still tend to pay women and racial minorities less than their white, male counterparts – an imbalance that can make these groups especially likely to leave for better-paying opportunities. In fact, workers who feel that their current compensation is lacking are more likely to seek a new job. The promise of a better salary or benefits drives 32% of job seekers to apply for new roles. Today’s workers value flexibility in their jobs. Overall, 11% of job seekers say flexibility is the most important element of a job offer – but 13% of women rank it first, compared to only 8% of men. Among workers who already have flexible scheduling, nearly half (41%) say it’s the most important perk they receive. Additionally, nearly 1 in 10 job seekers (8%) are on the job market because they are relocating. Jobs that are flexible on location or fully remote can both help companies retain these workers or widen a company’s available talent pool. These options are especially valuable to parents who need time out of the office to care for a sick child, attend school functions, or handle unexpected school delays or inclement weather days. When offering flexible work hours, companies must ensure that employees can actually take advantage of them. For example, an employee who is given permission to work from 7:00 am to 3:00 pm should not be required to attend meetings at 4:30 pm. Job seekers are interested in companies that offer flexibility, so companies may want to offer this perk. When candidates evaluate a potential employer, many are looking for opportunities to learn and grow at work. Among employees who already receive professional development, nearly one-quarter (22%) say it’s their most important perk. Nearly 1 in 5 job seekers (18%) are looking for more professional development opportunities in a new role. Job seekers also want to know if and when they can be promoted and how a company will support their long-term career advancement. Hiring managers should be transparent about possible paths for advancement during the interview process. For example, younger employees may value a mentorship program to support their long-term advancement, said Rich Franklin, founder and president of KBC Staffing, a staffing firm headquartered in Oakland, Calif.
Companies that support growth and professional development can boost employee loyalty, nurture in-house talent, and potentially reduce turnover. Meanwhile, professional development programs, such as certifications or online coursework, can help employees hone the skills they’ll need to succeed in leadership roles. By marketing professional development and growth opportunities during the hiring process, companies can show commitment to employees’ long-term career goals. When searching for a new job, candidates are relatively unconcerned with factors that don’t impact their financial goals, flexible scheduling, or career advancement. Only 5% of job seekers say that a company’s mission or values is the most important factor when evaluating a job opportunity. Despite reports that younger generations want to work for purpose rather than pay, our data shows that only 4% of millennials and only 6% of Gen Xers rank company mission over other factors. In a widely referenced report for Highline, a longform vertical within The Huffington Post, journalist Michael Hobbes investigated the many factors that threaten millennials’ long-term financial stability. Given this unstable environment, it’s no surprise that millennials, like other generations, prefer financial compensation over other perks. Similarly, only 4% of job seekers believe a company’s vacation or PTO policy is the most important thing to consider before accepting a job offer. This attitude can shift, however, if PTO is presented as part of an employee’s overall compensation. In a 2018 working paper, Harvard Business School found that employees are more willing to accept a lower salary in exchange for more vacation if companies list the monetary value of vacation days and similar benefits. Although companies can experiment with offering more generous vacation policies or selling candidates on their mission or values, these factors are significantly less likely to impact a candidate’s final decision. Compared to salary, flexibility, and professional development opportunities, benefits are not a determining factor during the hiring process. In 2017, one-third of organizations (32%) increased their overall benefits to remain competitive, according to research by SHRM. Yet our data indicates that only 10% of job seekers name benefits as their top concern. This may be caused by the rising costs of benefits and diminishing rates of employer-sponsored benefits. Over the past 25 years, employers have shifted away from defined benefit (DB) pension plans, which guarantee a certain amount of income in retirement, to defined contribution (DC) plans that rely on employees to set aside a portion of their earnings, according to the Office of Retirement and Disability Policy. 401(k) plans are the most common form of DC plans. If employees are unable to contribute to their DC plans due to financial constraints, the value of these benefits decreases significantly. Similarly, the cost of health insurance is projected to soar to nearly $15,000 per employee, according to a study by SHRM. Although large companies typically cover around 70% of these healthcare costs, employees are still responsible for higher premium contributions and other expenses. Companies typically emphasize the total value of a compensation package during recruitment process, including both salary and benefits. “When you receive benefits as an employee, you’re typically receiving a lower wage,” Franklin said. But Donovan argues that an employee’s salary directly impacts their ability to participate in other benefits. Most companies are familiar with benefits such as health insurance, dental insurance, and a 401(k). These are not, however, the only benefits employers can offer. Some employers are beginning to offer student loan repayment benefits, sometimes referred to as SLRPs. With this benefit, an employer makes monthly contributions toward an employee’s student debt, or matches an employee’s existing contributions toward their loans. Due to the complexity of varying loan providers and payment plans, most employers who offer this benefit do so through a third-party vendor. We found that 31% of job seekers encountered student loan repayment benefits during their most recent search. This number reflects growing awareness of student loan repayment benefits, but does not signal widespread adoption. Experts in the growing industry of SLRP service providers estimate approximately 5% adoption, in line with estimates of 4% adoption in 2017. Matt Beecher is CEO at Vault, a software company that creates secure payment integrations that allow companies to administer student loan repayment benefits. He says that the competitive job market has pushed companies to invest in benefits that drive loyalty among employees. The impact of student debt cannot be overstated. As of November 2018, Americans have collectively accumulated $1.4 trillion in student debt. The average borrower owes $37,172 and is responsible for paying between $388 and $444 per month. Although many employees affected by student debt are recent graduates, people over 60 are the fastest growing sector of borrowers. More than 70% take on student debt because they co-signed a loan with a child or grandchild, helped a younger family member refinance an existing loan, or accrued debt from their own education. Some companies feel it is unfair to offer student loan repayment benefits because not all employees have student loans. In reality, employees who have student debt accumulate 50% less in their 401(k) by age 30, compared to employees who do not have student debt, according to a study by Boston College’s Center for Retirement Research. In other words, employees who face high levels of student debt may not be receiving their full compensation package if it includes 401(k) matching. Greg Poulin, co-founder and CEO of Goodly, a student loan repayment vendor that launched in April 2018, says his company sees a direct relationship between SLRPs and other benefits. “Our goal with Goodly isn’t to replace other benefits but to help employees pay off their loans faster so they can start participating in things like their 401(k) and retirement plans,” Poulin said. SLRPs can help employees participate fully in other employer-sponsored benefits. As awareness of SLRPs grows, employers should be prepared for questions about whether they will offer this emerging benefit. Student loan repayment benefits can reduce turnover and improve diversity, helping a company’s bottom line. According to Poulin, employees who receive student loan repayment assistance may be willing to extend their commitment to a company, potentially improving retention and delaying the need to begin a costly, time-consuming recruitment process. “By extending the lifetime value of an employee while they’re still a fully contributing member of the team, the ROI is clear for a lot of companies,” Poulin said. Franklin’s experience supports Poulin’s argument. "Student loan debt is a growing problem, and it’s something people find incredibly stressful to manage. If you can take care of that as a business owner, then you really do help your employees out." Employees who receive student loan repayment benefits may stay with their employers longer. Because student loans affect racial, gender, and other minority groups unequally, student loan repayment benefits also support diversity. “Student loans can affect folks of all backgrounds, but student loan debt does tend to disproportionately affect women and underrepresented employee groups,” Poulin said. He’s correct. In 2016, Brookings found that black students graduate with an average of $7,400 more debt than white students, and that the debt gap triples within a few years of graduation. Women hold nearly two-thirds of all student debt in America, and black women have the highest levels of student debt compared to any other group. Similar patterns plague Latinx graduates, disabled graduates, LGBTQ graduates, and other minority groups. Companies that are serious about improving diversity must consider how employees' student debt impacts their career decisions. SLRPs are becoming easier to administer and promise key benefits for businesses. In today’s competitive job market, companies should pay attention to what job seekers are looking for in their next role. Job seekers who want better pay or benefits will focus on finding a competitive salary and may be interested in emerging benefits such as student loan repayment that support their long-term financial goals. Although job seekers aren’t focused on vacation policies or a company’s mission, many still value certain perks. In particular, job seekers want more flexibility and opportunities for growth and development. Each of these factors presents new opportunities for companies to support diversity and establish more loyal relationships with their employees. 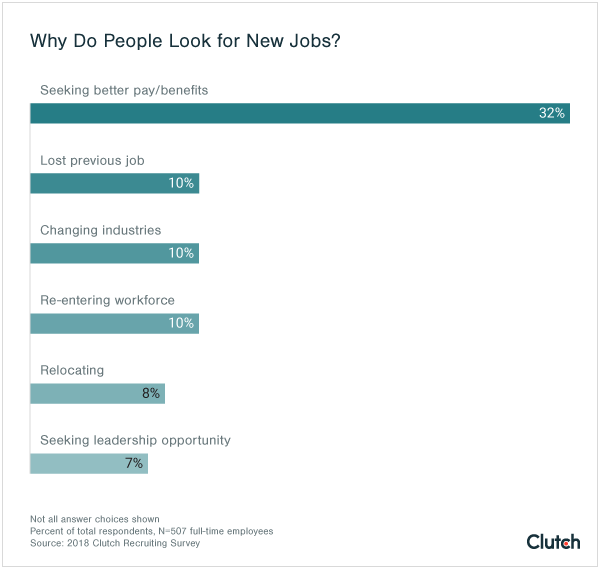 Clutch surveyed 507 full-time employees who started a new job within the past 6 months. Respondents work in a variety of settings, including large businesses with more than 500 employees (35%), medium businesses with 250-500 employees (20%), small businesses with fewer than 250 employees (19%), fast-growing startups with fewer than 100 employees (17%), and miscellaneous other businesses (9%).